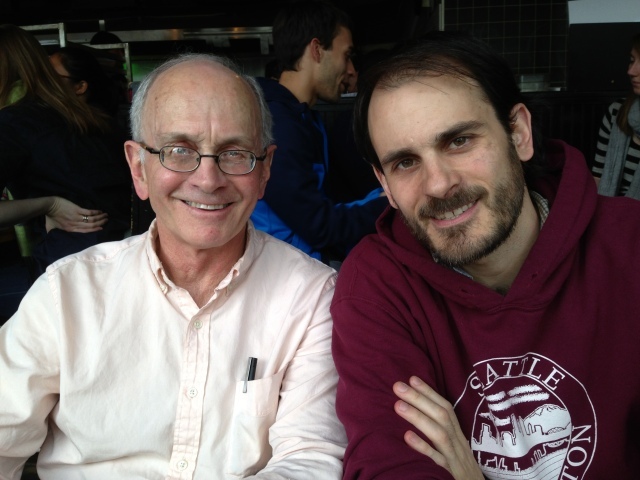 In February of 2013, Burke Stansbury, a Social Justice Fund board member, invited his father, Michael, to participate with him in the Economic Justice Giving Project, and in March they jumped right in, becoming the first father-son team to engage in a Giving Project together. For me, it was a logical step to invite my dad in. Since I started getting involved with Resource Generation nearly 10 years ago I’ve increasingly thought of myself as a “donor organizer.” And what better donors to organize than your own parents, especially if they have more access to resources than you do? In 2007, I worked with my parents to start a family foundation and we meet annually along with my partner Krista to make a set of grants. In 2010, I joined a group of Resource Generation members and community organizers in Washington DC in founding the Diverse City Fund, a foundation with a rotating grantmaking team made up of community leaders of color. It’s been a fulfilling process, inspiring me to move even further into the realm of collective, de-centralized giving. When I moved to Seattle last year I searched for a similar vehicle for giving and found Social Justice Fund NW. Donating to Social Justice Fund and participating in a Giving Project was the perfect way to align my values around democratized decision-making in philanthropy, while also building community across class and race. Shortly after our final Economic Justice Giving Project I sat down with my dad to ask him a few questions about how it went. Burke: The facilitators of our Giving Project helped us all develop personal stories that we could use when pitching potential donors to the project. Can you give me a piece of your story? Michael: What I told people is this: one of the things that really crystalized my sense of economic injustice was watching our family asset base grow rapidly since 2008 or 2009 once the so-called recovery began. At the same time, I was reading the statistics about how devastating the situation was and continued to be for poor people and families of color – disproportionate loss of jobs and homes and, in many cases, a complete wipeout of net worth. This struck me as terribly unfair and something that should prompt me to do something, even though I didn’t know what (any immediate effect on national social and economic policy seemed out of reach). So I was searching for a way to have some impact, however small. And the Social Justice Fund proved to be a way to confront what had happened economically to people like me and what had happened to those who were far more vulnerable. So I started out as a curious and somewhat frustrated observer, and through the giving project became an advocate for this kind of direct support at the organizing level. Burke: You talked a lot about not being exposed to a race analysis prior to this. Now that you have gone through the Giving Project how has it changed way you think about things? Michael: Much of what we covered about race and class was material I knew as general background. But the sessions made the issue of race and racial justice far more vivid and also brought attention to my own knee-jerk reactions around whether I was a part of the problem. Not in the sense that I was deliberately undermining approaches to class and racial equality, but rather that my own discomfort around talking about the issue made me more passive than I should be. That realization made me uncomfortable, but it was probably a good thing. Burke: How would you describe your experience as by far the oldest participant in our group, and what would you say to other people of your generation about why they should join a Project? Michael: I think it was interesting in a couple of respects; I’m 70 and most of the people were in their 20s and early 30s. In the beginning I was a bit of a curiosity and we all played on that for humor. At some point my age identity receded to the background and I felt accepted as just another member of the group. And that was fun – and a very interesting dynamic to lose my identity, not just as an older person but also as someone whose background has been as part of the elite. I would definitely encourage other people of my generation to participate. One of the benefits is being stretched out of your comfort zone. It’s easy at my age to get locked into your comfort zone, to just join arts organizations, for example (which I do). That’s a little too comfortable. So I appreciated being pushed to interact with people who come from a different place. One other thing: it’s easy to feel like economic injustice doesn’t affect US (i.e. people who are older and well-off). But I’ve come to believe that income inequality has an overall negative effect on growth and the economy, and that it IS going to affect us all – including my children and grandchildren – unless we address it. So there’s a dimension of self-interest too. Burke: You said that talking about money and philanthropy publicly made you uncomfortable, but that you still felt satisfied to have made a meaningful gift. How does is feel now? Michael: I am inherently uncomfortable talking publicly about money, about making contributions and about where our family is in terms of having financial resources. So having this discussion with the big group was uncomfortable, and it still makes me a little uneasy looking back. But I’m glad I made the gift I did and I would do it again. One of the good things about the giving project is that the gift each of us made personally had no real bearing on the process of making grant decisions. I experienced that first-hand by having one of my preferred organizations discarded by the rest of the group (no senior citizen deference here)! And that was a good process. Ultimately it took some of the discomfort out of the public quality of making a contribution. Burke: Any final reflections on the Giving Project? Michael: In retrospect I found it a more complete experience than I had anticipated. For example, though I understood it abstractly, I wasn’t really ready to be confronted with the interrelated nature of race and class and wrestle with whether our work in the giving project would have a material impact. Also, the exposure to groups and their needs was more immediate and dramatic than I anticipated, and the process of making the grant decisions was more intense and personal. Finally, I came away from the project satisfied at having contributed hopefully in an immediate and tangible way to specific groups of marginalized people. The magnitude of economic and social injustice is so staggering that I sometimes feel embarrassed about my small effort in the Giving Project. But I nonetheless felt I was having some helpful impact on the lives of the real people that I met and others like them that I didn’t meet. Different approaches require different scales of action. I appreciated being involved at the scale that might have the most immediate and direct human impact. And that’s probably why I’ll stay involved in this very important effort and look for more ways to press for change.